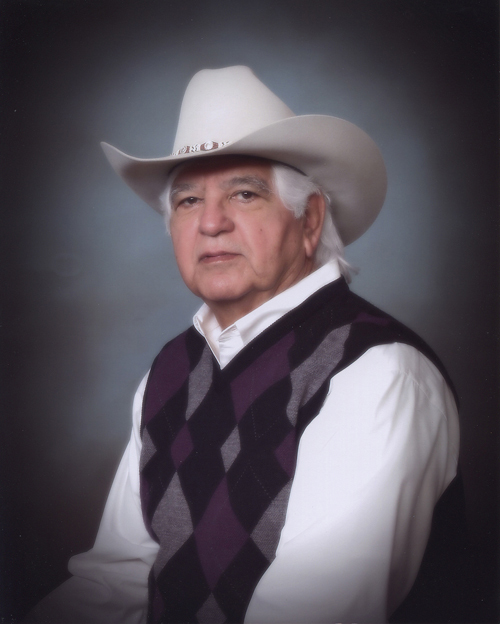 Ruben V. Reyes, one of the premier livestock auctioneers in the industry and with a career that spanned almost 50 years, passed away on February 22, 2014, at the age of 73. He called hundreds of cattle sales across the United States and Mexico. He was primarily associated with the American breeds and was heavily involved as these breeds gained recognition in the industry. He would bring the gavel down for some of the most exciting sales in the history of the Brangus breed and was part of that breed’s tremendous growth and expansion period in the 1980s and 1990s. Reyes was involved in many historical sales, including the first bull sales to gross over a million and then two million dollars at Brinks Brangus and asked for the final bid on many of the highest selling bulls and donor females of the times. At many of the major Brahman sales in the U.S., Reyes’ bilingual auctioneering skills were an asset to breeders who marketed cattle to international cattlemen. He was also instrumental in the importation of the first fullblood Simmental bull by a group of U.S. cattlemen. That bull, “Amor”, entered the United States from Canada with Reyes at the halter. He also sold many Herefords during his life and was part of the auction team for the prominent LBJ Hereford dispersal following the former president’s death. Reyes was the youngest of 14 children born to Carlos and Maria Reyes in Berclair, Texas. His family was involved in agriculture, and his love for cattle was developed at an early age. He graduated from Texas A&M University with a degree in animal science in 1965 and remained a very loyal Aggie throughout his life. While at A&M, he was part of the 1965 International Champion Livestock Judging Team, and that team is still regarded as one of A&M’s best, winning Denver and Fort Worth as well as the International in Chicago. His love of Aggie football was known by all, as he could recount plays, scores and stats as far back as Paul Bear Bryant coaching days. After graduating from Texas A&M, he attended Superior School of Auctioneering in Decatur, Ill., the same year. His first sale was an offering of Hereford bulls in San Angelo, Texas, in 1966 and Reyes never considered another occupation from that day forward. Managing and selling cattle was his passion. Reyes travelled countless miles over the next 48 years selling purebred cattle and helping breeders market their product. Because he could auctioneer in English and Spanish and jump back and forth between the languages, he was in high demand for sales that drew international buyers. Reyes also donated his services from the block for many causes over the years. Donation items to build buildings, fund junior cattle organizations and support breed association work were all sold by Reyes. “Ruben was a true professional. When you booked a sale with him, you knew he would be there, arrive early, be positive, treat every buyer and seller with integrity and work hard the entire sale. He was a friend to this industry and made every breeder feel significant. We will miss him and his presence on the block,” said Sammy Pierce, who managed many of the sales Reyes auctioneered. Reyes was widely recognized for his commanding voice and skill at securing top prices for cattle, but he also is credited for giving many industry professionals their start in the cattle marketing profession including Anthony Mihalski; Leo Casas, III; and Terry Reagan to name just a few. Survivors include his loving wife, Myrna Morgen Reyes; his three sons, Gary Reyes (Faith), Randy Reyes (Veronica) and Rico Reyes (Ebony); sisters Rachel Gonzalez, Florinda Rodriguez (Victor) and Estella Naranjo and brother Mike Reyes (Elida), as well as numerous grandchildren, nieces and nephews. He was preceded in death by his parents, Carlos and Maria Reyes; sisters Tillie, Christine and Martha; and brothers Lucas, Carlos Jr., Alvino, Tony and Pete. A celebration to honor Reyes’ life will be held Sunday, March 2, at 2:00 p.m. at Aggie Park in San Antonio, Texas. In lieu of flowers, the family requests donations be made to the Ruben V. Reyes scholarship fund at Texas A&M University, which will benefit students from Bee County, Texas. Leave a comment Posted in News Tagged auctioneer, brangus, Hereford, industry, international, obituary, Ruben Reyes, Simmental, U.S. The IBBA has removed the “live” aspect of the genetic conditions portion of the Brangus portal (website). We still have it “live” for the staff but not for the membership. Some of the breeders were complaining that their animal would show as a “potential carrier” (PC) one day, and then the next day it would change to nothing (no genetic impact), and then the third day it would be back to PC. This is all due to animals in between the individual, and its original relation (e.g. great grand sire, grand dam, etc.) have results entered into the database at different times. This will occur in the future but will have less impact once we get the majority of the tested cattle results in our system. Nearly 75,000 Developmental Duplication (DD) results from other breeds (Angus, Red Angus, etc.) are being added to the IBBA database at this time. Through programming, all animals with impacted genetics will be tagged with the proper genetic condition tag. We hope to make these achievements this week and go back “live” with the genetic conditions.